Aussie David Brabham and American Scott Sharp have won the second round of the 2009 American Le Mans Series on the streets of St Petersburg in Florida. The win was the ageless Brabham's 17th class win in the American Le Mans Series and his eighth overall victory. It was his first LMP1 win since Washington DC in 2002. The Patrón Highcroft team finished third at St Petersburg two years ago, second last year and finally scored the elusive win in 2009. After starting on the front row Brabham's driving partner Sharp slotted into second place behind the similar de Ferran Motorsport Acura ARX02-a. Despite battling an oversteering car in the opening half of stint, Sharp was able to hold on to second place behind the leading de Ferran car. The de Ferran effort fizzled when their Acura developed electrical problems, slipping a lap down and then retiring. Brabham took over from Sharp and, despite a radio issue that prevented both pit and driver from communicating, the Australian was able to press on to the finish to claim the first win for the new Acura. "It is very satisfying to score Acura's first LMP1 victory and Patrón Highcroft Racing have a habit of delivering firsts for Acura," Brabham said. "After we got into the lead, it was very important that I didn't make a mistake. It looked easy out there but it wasn't at all - the track was incredibly slippery. "Turn one felt like it was wet and I could have very easily spun a number of times." 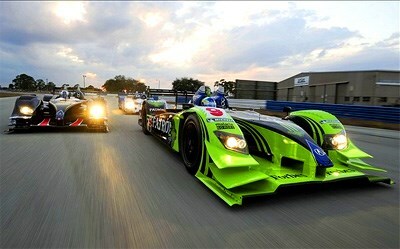 Round three of the ALMS will be held on the streets of Long Beach on April 18.